A book titled ‘Sajith Premadasa: The People’s Leader: The Legacy of Ranasinghe Premadasa’ written by Dr. Telli C. Rajaratnam is scheduled to be launched in February (ISBN 978-955-51312-6-1). The book consists of 19 chapters and 300 pages with hard cover and jacket of the same artwork in full colour. 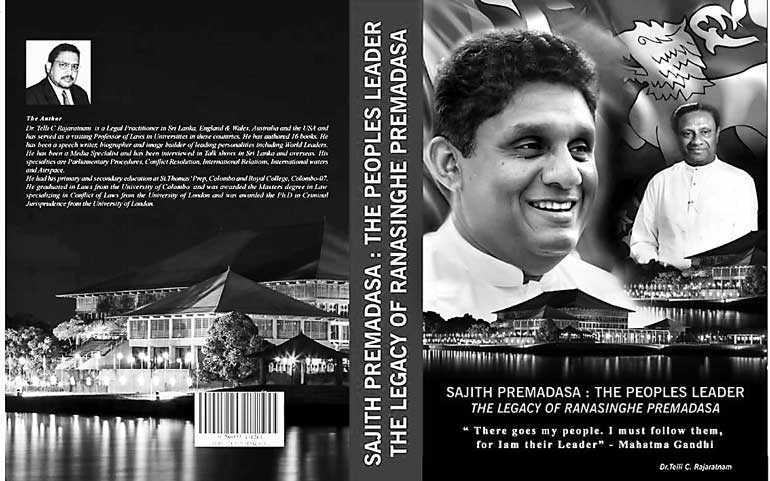 It illustrates Sajith Premadasa’s career and vision and includes the housing programs, his speeches in Parliament, his press conferences which depict his wisdom, maturity and understanding of democracy, human dignity, rule of law, media freedom, humanity and humanitarian principles. The book also illustrates reflections of the great contribution made by President Ranasinghe Premadasa, his father. Just below the title of the book the following is cited: ‘There go my people, I must follow them for I am their Leader’: Mahatma Gandhi. Sajith Premadasa was born on 12 January 1967. Sajith attended St. Thomas Preparatory School, Royal College, Colombo and Mill Hill School, London. Sajith won the A/L prize for politics and business studies and besides being appointed a Prefect, a rare honour for any foreign student, also played in the first 11 cricket team for four years, captaining the side in 1986. A graduate of the London School of Economics (LSE) and Political Science of the University of London, his degree covered the areas of economics, politics and international relations.Following his BSc at LSE, Sajith decided to pursue a Master’s degree in Public Management at the University of Maryland, near Washington DC. During his studies Sajith also had the rare distinction of completing his internship at the U.S. Senate working in its Foreign Relations Committee under Senator Larry Pressler a Republican from South Dakota. Sajith met many other influential senators, including John McCain and former presidential candidate John Kerry.After years of working at grassroots level, Sajith entered Parliament in year 2000 polling the highest number of preferences in Hambantota and the highest preference vote percentage of the whole country. For the fourth general election in a row, Sajith Premadasa won the highest percentage of preferential votes out of all United National Party candidates. Premadasa is the Deputy Leader of the United National Party. Sajith Premadasa has focused on a several programs for the people, housing and other necessities in the lives of the less fortunate, poorest of the poor and the downtrodden including assisting Buddhist temples and Sunday schools. Sajith Premadasa is an excellent orator like his father. During the turmoil created recently, he acted with dignity wisdom and maturity. Most of the vital press conferences are illustrated in the book. The author is Dr. Telli C. Rajaratnam. The foreword is by an American Professor. The book contains 300 pages, hard full cover with same artwork full colour jacket. Sponsors are invited and welcome for sponsorship which will be acknowledged in the book with extensive media coverage. Those interested can contact chambersaps@gmail.com or Nayomi Ratnayake on 0778497755.